We did it. 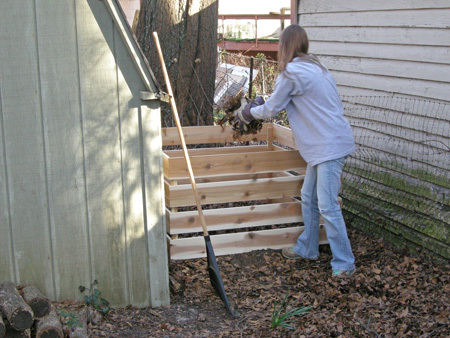 We finally joined the composting culture. I needed a box to contain the pile in. So even though we didn’t have a box yet we added scraps to a pile. 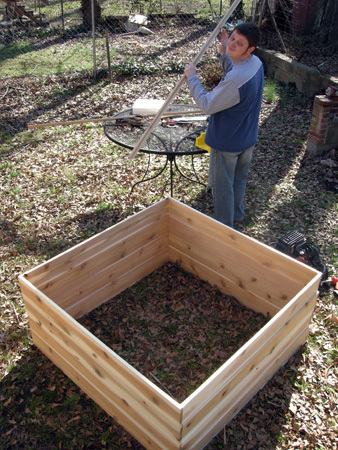 But the compost didn’t really become official in my eyes until we built the box today! Patrick determined that even though it won’t be the cheapest method we should build it with cedar so it won’t weather as quickly. So off we went to the big box store and bought some 1″ x 6″ x 8′ cedar boards for the walls and 1″ x 2″ x 8′ for the supporting legs. Thankfully the big box store offers cutting, so we went ahead and got them cut in half (1″ x 6″ x 4′) so we wouldn’t have the extra work ourselves. The store had the super saw and was able to cut all eight boards in one go! So here’s our pile of materials all ready to go! 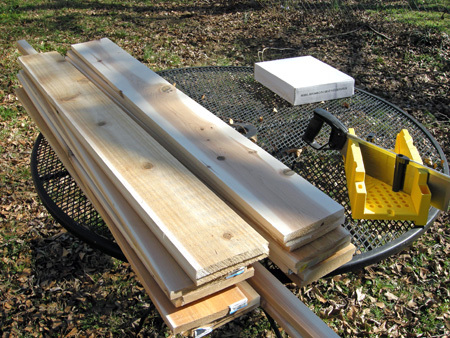 Step 1: Nail/screw together your boards to make a box. Step 2: Cut the supporting legs into 7 inch pieces (1 inch larger than the boards to allow air flow). Attach legs to interior box walls. Step 3: Stack your boxes on top of one another over the started compost pile hidden behind the shed. Step 4: Throw in some leaves that you haven’t cleaned since fall for good measure. Step 5: Mix up the pile of kitchen waste and leaves. 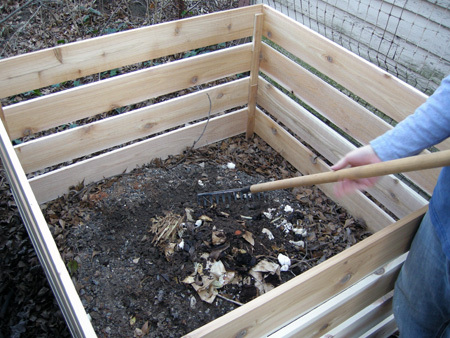 Since we’re composting virgins we’re obviously curious what our mess will turn out to be. I understand not too much will probably happen until the temperature goes up a bit more. We also bought one of those earth test kits. I haven’t actually used it yet. That way we’ll hopefully be able to find out what our compost pile will need most of to neutralize the existing earth in the garden. Wish us luck in our new venture! 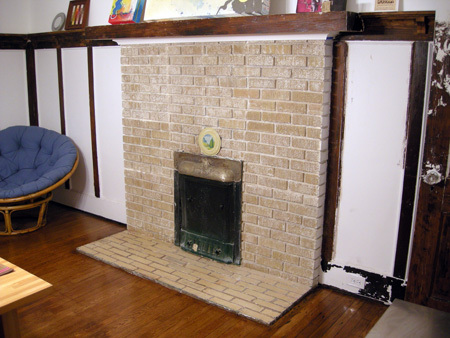 We finished paint removal with PeelAway on the brick and tile of the fireplace last night. Well, or at least the front. I suppose we didnt do the thin strip on each side. So this is the result we got after using the PeelAway one time. You can tell how we did it in sections because the PeelAway hardened more at the edges. You can also tell we were in a hurry in the top left corner! We removed it, but had to leave to go to a BeltLine meeting and werent able to do our usual thorough cleaning. As we progressed with each section we tried various methods of after-PeelAway-cleaning. Initially we used the sponge method and lots of towels and switching out water. Towards the end we used a spray bottle and a dust pan to catch the drippings. Then wed use a little nylon brush to rub off the remains in the cracks as best as possible, as well as our metal scrapers to get things out of the cracks. perhaps you should either not remove the paint, or hire someone to do the work for you. This will definitely still require some scrubbing and cleaning and work, but I think it helped a lot and we were probably able to cover a larger area quicker than we would have with the KleanStrip. Obviously the more textured the area, the harder the work will be. So overall were very happy with the results from the PeelAway. So the next steps will be to apply the PeelAway on the metal cover. We have worked on it with KleanStrip on a previous occasion, so we already know it should be a brass cover. Were curious though if we will uncover any additional details! (We’ll show what we’ve uncovered this far when we work on it some more.) 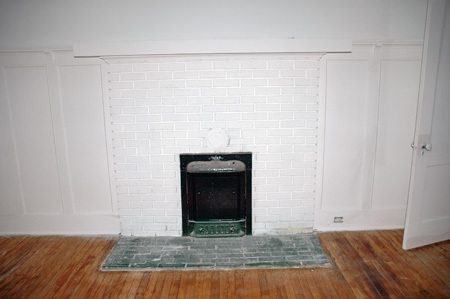 Then we have to also remove the paint from the brick on each side of the fireplace. Lastly well probably use KleanStrip to go back and try to remove some of the leftover paint, like where the seams show, or where we ran out of time to properly clean the area. But were really excited about how good this looks already!